Purestrike has come up with a nifty idea to launch itself into the putter market – putters with no loft. The idea is that this helps to impart topspin. We were pretty sceptical at first, but after trying this we have to admit there may be some proof in the Purestrike pudding. Putts ran and ran, and we were all impressed. The young company is only producing one style at the moment, but if more designs appear with a slicker finish, they could be serious contenders in the future. 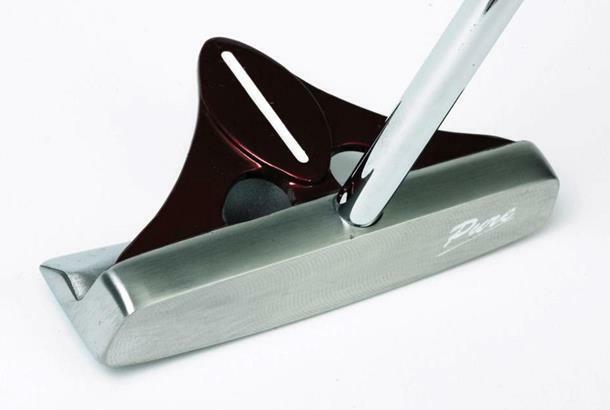 A perfectly-weighted, face-balanced putter designed to give a positive roll with positive feel. I have used this putter for a number of years now and can honestly say the one constant in my game is Putting! The confidence my putter gives me is total, the feel upon contact is solid without feeling overly heavy and the 2 thumb grip allows a very comfortable, neutral stance. Furthermore I recently lost my Headcover and contacted Purestrike for a replacement fearing a hefty replacement cost but I was quoted £5.00 + P&P which I thought was very reasonable. I cannot recommend the Purestrike enough but it's great that a local UK based company can produce such a cracking product. Well done! The Purestrike experience is not for the faint-hearted. The putter finally turned up after 7 weeks, but the grip was noticeably off-line with the blade. One re-grip with a Winn AVS later, I was in business. You have to completely change your set-up with this club. The ball must be well-forward and the shaft angled back to de-loft the 2 degress of NEGATIVE loft. This means you get a great upward strike on the ball with a nice top-spin roll. Holing a lot of 6-8 footers and gone from ~33 to ~31 putts per round so far. 5 stars to make up for the earlier 1 star rating! I haven't holed a single putt with a Purestrike, largely because I haven't received one. I ordered one to be delivered to my local proshop 6 weeks ago, and despite being assured every week by Purestrike that it would be "two or three days", it has never turned up, and I have given up. At best their customer service is abysmal, at worst there is something dubious going on. If it ever does arrive, I'll post another review.